Compression socks arent just for senior citizens! Pilots, flight attendants, runners, pregnant women and nurses all wear them! Should you be wearing them? Lets learn together. The most common reason people wear compression hose is they are at risk for blood clots in the legs, known as deep vein thrombosis (DVT). Some factors can increase the risk of these clots, such as bed rest, sitting for long periods, use of birth control pills or hormone replacement therapy, pregnancy, family history of DVT, inflammatory bowel disease, and certain genetic clotting disorders. Other groups that can benefit from wearing compression stockings include people with varicose veins, leg swelling , as well as those with circulatory problems. Blood in your veins has to work against gravity to flow back to the heart. Anything that slows that flow—such as venous insufficiency—results in blood pooling in the veins of the lower legs or feet, leading to leg swelling, achiness, and leg fatigue; it could also predispose you to a venous clot. By squeezing the leg tissues and walls of the veins, compression stockings can help blood in the veins return to the heart. They can also improve the flow of the fluid (called lymph) that bathes the cells in the legs. Improving the flow of lymph can help reduce tissue swelling. In general, if you have any medical condition, talk with your health care professional before using compression stockings to see if you’re a good candidate for them. 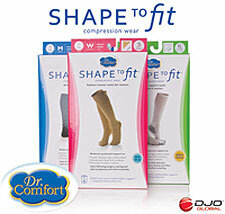 You can buy compression stockings online, in pharmacies, at medical supply shops, and right here in our office! Compression stockings come in four or five main levels of compression, which refer to the amount of pressure (measured in millimeters of mercury, or mmHg) applied to the leg. The higher the number, the greater the compression. It's a good idea to get at least your first pair at a medical supply shop or podiatry office with a professional fitter. This will ensure that you get the right fit, plus learn how to put them on properly. Take home message: If you have a medical condition, talk with your doctor about whether you might benefit from compression stockings and what type might be best for you. If you’re healthy and want to try using them because of a long flight, a job that requires lots of standing, or another non-medical reason, you can experiment to see what’s most comfortable and works best for you, starting with a low compression level.